I just can not believe that the kids will be out of school in what’s now down to a countdown of days. As I drive around town I see the neighborhoods working on getting the pools ready for opening. I love summer so I find this all pretty exciting although to be honest I have yet to figure out how to keep the kids busy enough that they don’t drive me crazy by the second week in June. Not to mention trying to get a little work done in there somewhere. I’ve got lots of things I’m wanting to work on and share with you guys so I promise you somehow I will find a way to get it done! 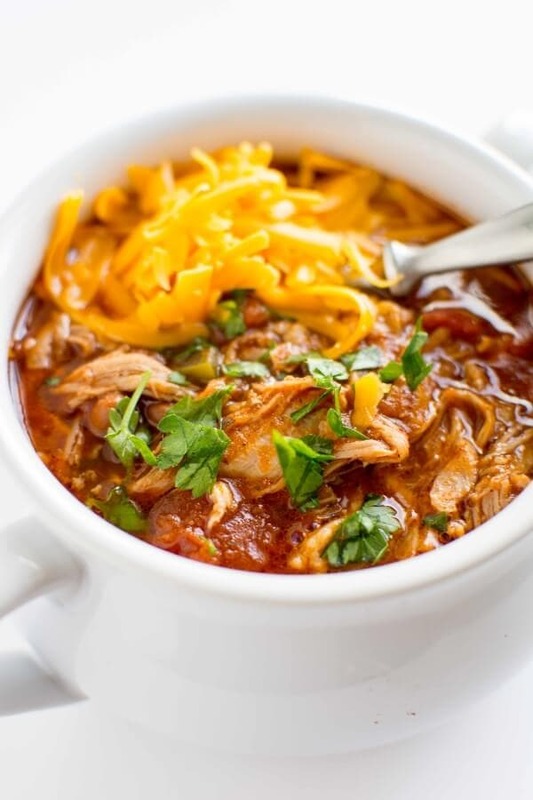 My slow cooker is usually going non-stop all summer anyway so that we can enjoy the afternoon at the pool and never worry about what’s for dinner. This week, however, has been all about spring. Spring in the Midwest to be more specific and that means we’ve had rain and thunderstorms pretty much every day this week. 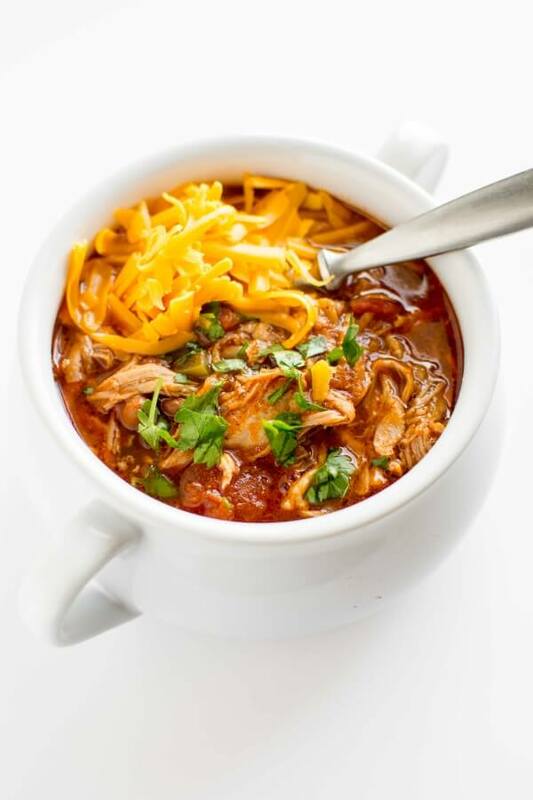 What goes better with a rainy day than a big pot of chili?!? Or should we have pulled pork? 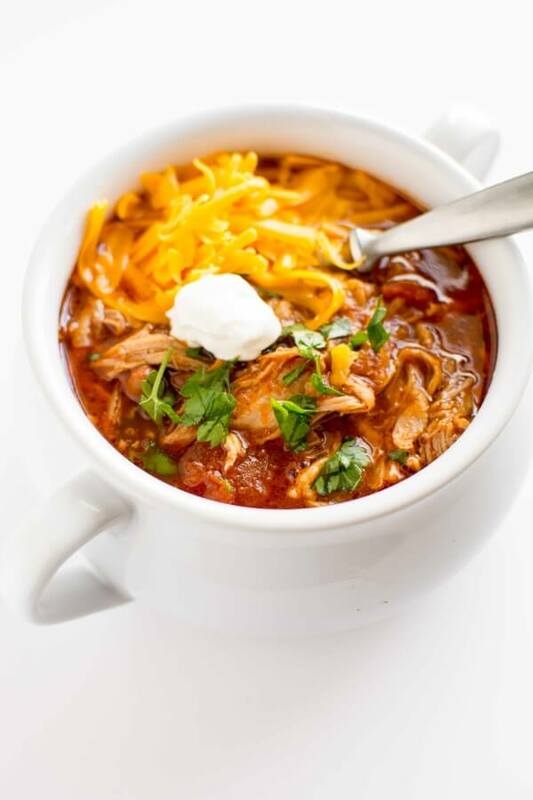 Maybe we should just make it Pulled Pork Chili! Cook it super slow and let that pork get super tender. 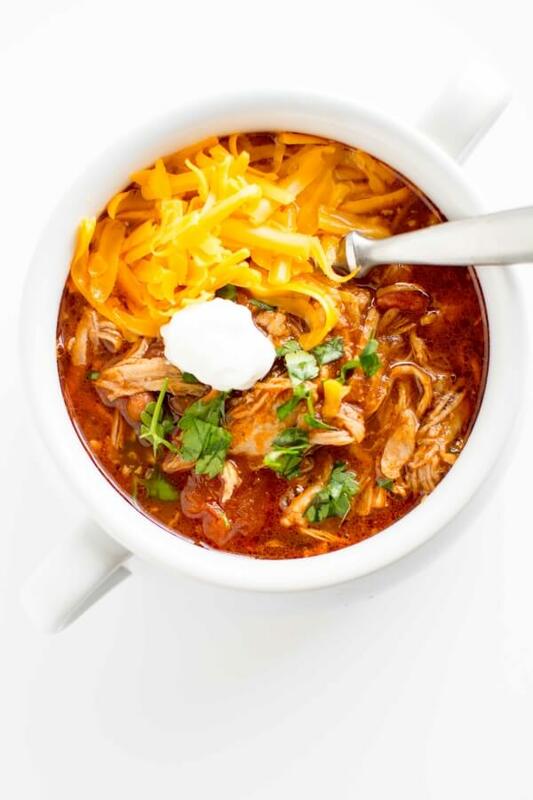 A nice little bit of chipotle chili powder to spice it up just right. Add a little beer in here if that’s a flavor you enjoy, otherwise chicken broth will work just as well. 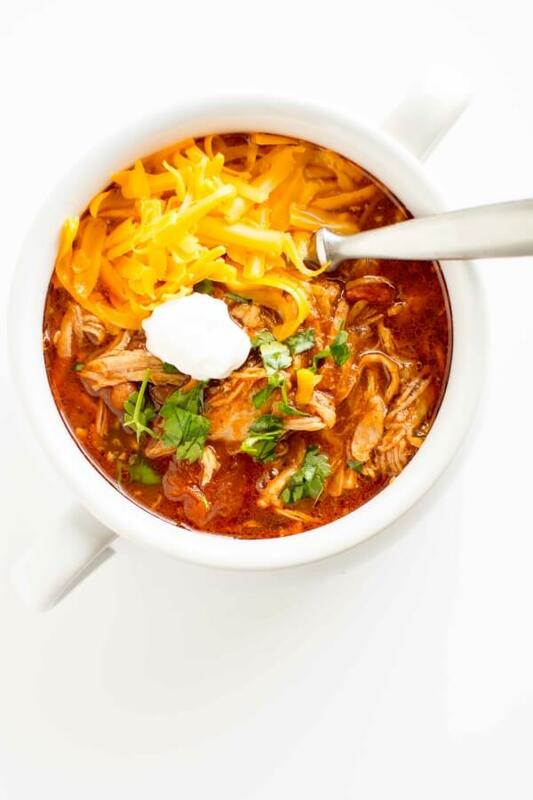 Either way, this chili is perfect for a rainy (or any busy) day!! Serve as desired with cheese and sour cream or just plain! Hi, made this for dinner on a busy day this week and it is yummy! I was wondering, can I freeze the leftovers? Yes, you can! Just remove all air from the bag or container and it will freeze and keep for a couple of months! 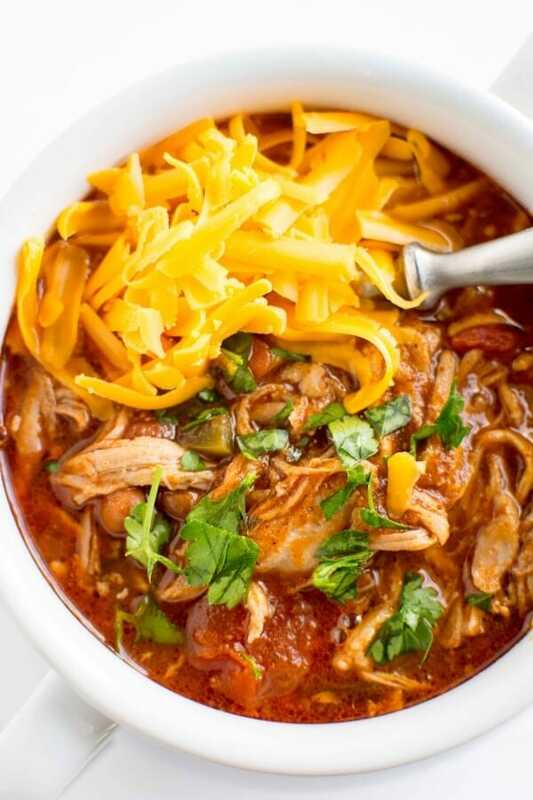 Wondering how I would convert this to an Instant Pot Recipe rather than Slow Cooker. Any ideas? Hi Robin. I haven’t tested so this will just be a starting point if you want to give it a try. I’m not sure the beer would work well in the pressure cooker so I’d probably swap out for chicken broth. I’d cut the pork into a few smaller pieces and start with 60 minutes on high pressure. Improvised! I didn’t have jalapeños, but I did have 2 Serrano’s..I didn’t have canned tomatoes or sauce, but I DID have a jar of salsa and 1/2 can of tomato paste! I used more chili powder and also added salt that wasn’t in the original recipe. Used the chicken stock in place of the beer to keep it Keto. I cooked it on high for 5 hours because I got a late start. We liked it a lot! Thank you for the inspiration! I love that!! Your version sounds delicious! Hi there. Would this recipe still work if I cooked it for 4 hours on high as opposed to 8 hours on low? You may end up with meat that is not as tender and could possibly be dry. I wouldn’t recommend it for this recipe. Hi, I was just wondering if it would be okay to leave the beans out? 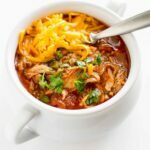 I’m not huge on them in my chili but didn’t know if it would change it a huge amount or not! Yes, totally fine to leave the beans out. Hi! 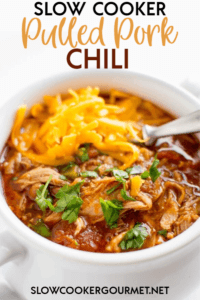 the chili was great!! what is a serving size? One cup, two cups? I’m so sorry, I don’t the notes for that and I should have added that info! I’ll have to make again and measure! !